The Department of Transportation accepts applications for specialty and personalized license plates. Personalized license plates must follow the state’s guidelines and be available for registration. All residents using vehicles on the roads in Pennsylvania must be registered and have valid decals on their rear plates. The standard license plate issued in the state of Pennsylvania has a blue, white, and yellow background with blue lettering. These license plates will be provided when you register your vehicle. Alternatively, you can apply for the other license plates available if you follow eligibility criteria and provide payment for any additional fees. You’ll be required to submit the appropriate documents and proof of eligibility for certain plate types. Additional fees are added in addition to the standard registration fees. These additional fees vary by specialty plate type. You can search for available plates numbers online. There are additional fees for personalized license plates in addition to the regular plate fees required at registration. If you have the required documents for a disability, you may be eligible to apply for disability license plates and placards. Placards must be displayed from the rear view mirror. You can register your vehicle with the Department of Transportation within your county. If you have a new vehicle or own an out-of-state vehicle (i.e. new residents), your vehicles must be registered promptly. 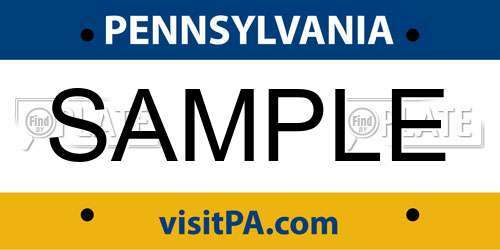 Depending on the type of Pennsylvania license plate you requested, you may have to wait up to 4 weeks for your plates to be processed and delivered. You’ll be required to renew your vehicle’s registration at the date indicated by the decals on your rear license plate. After paying the renewal fees for your vehicle, you’ll receive new decal to place over the old one on your license plate. You may be able to transfer Pennsylvania license plates to a new vehicle if it is registered in your name. You cannot give away your license plates when you sell, auction, or donate your car. License plates can be surrendered by mailing them or dropping them off in person to the nearest DMV office. It is possible to apply for replacement license plates by mail and it will take up to 4 weeks for your new plates to be processed and delivered. Note: you should notify the police if you believe your plates have been stolen. This is not mandatory, but doing so can help prevent their misuse. Any taxes or service fees are not included in the costs you see above. You should contact your local DMV office in Pennsylvania to get complete details for the fees required for the vehicle you own. If you’re personalizing your license plate, you can use the search bar above to find available plate numbers in Pennsylvania and any other state in the U.S.
You can obtain additional information about a vehicle such as vehicle history, theft reports, images, and more.